Super Mass Email Direct Sender is the best mass email software for sending your mailing lists, such as newsletter. With it, you can send and track mass emails to your customers. It allows you to spread your products and services to your customer in a short time. 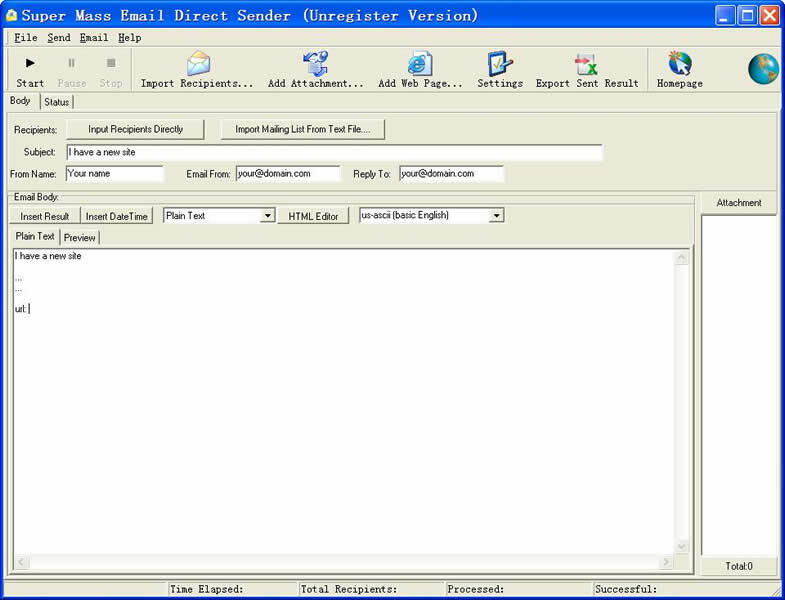 Super Mass Email Direct Sender is a professional, high speed, mass email software. The normal sending speed can be up to 100000 emails per hour. It has a simple user interface so that anyone can master it up in a few minutes. It has build-in SMTP server, users don''t need to enter SMTP information to send mails. Very easy to send email to many recipients. Supports to remove duplicate email addresses automatically. Each email is sent to each recipient individually, in other words, each recipient can only see his email in the mail header. Supports both text and HTML format mail.